Our Michigan personal injury lawyers represent clients who are injured by ceiling tiles that fall on them in stores, restaurants, businesses, and rental properties. Tiles that are not properly secured to the ceiling or are poorly maintained often fall and strike a person standing just beneath. Negligent maintenance and the failure to inspect the safety and security of the tiles is also a major reason for these incidents. Many of these tiles are very heavy and just a few feet fall can cause very serious injury and harm. Serious injuries often result from falling merchandise and boxes. These include closed head injuries, traumatic brain injuries, and spinal cord injuries. Lacerations are also a common injury. Under Michigan law, the property owner or business owner has a duty to provide reasonably safe place of business for its customers. 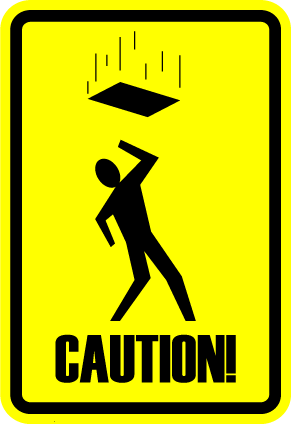 The property owner is liable for injuries resulting from unsafe conditions on the property, including falling tiles. The injured person must prove either that the property owner caused the unsafe condition or knew, or should have known, of the unsafe condition. It is important to report the injury incident to the store manager or property owner immediately after the accident. If you are requested, make a written report with important information about the accident. If possible, you should take pictures as well with a smart phone camera. These things will all provide important evidence to support a legal claim filed at a later date. The insurance company for the property owner may have an adjuster contact you to take a statement before you meet with a lawyer. The adjuster is trained to get you to say things that may later ruin your case. Speaking to an adjuster before you hire a lawyer is a mistake for that reason. We strongly suggest that you contact our personal injury law firm before you speak to any insurance adjusters.